For many years I have had this infatuation with the amazing Saguaro Cactus. From the first time I saw them in paintings by Texas artist Downe Burns I was on a mission to see one in the flesh, so to speak. In about 2006 my dream finally came true and I got to see one up close when we landed at Phoenix Airport. I was so happy but that night, after doing some more research on these spiky giants I found that I really need to see them at the Saguaro National Park further south in Tucson. Fast forward 13 years and we started planning another USA road trip. No second guesss needed to work out where I intended to start this new adventure. 1 Where is Saguaro National Park? 2 What is the difference between Saguaro East and West? 7 Is the Saguaro National Park worth visiting? Where is Saguaro National Park? There are actually two seperate National Parks, the imaginatively named Saguaro East and Saguaro West. They are seperated by the city of Tucson in southern Arizona. What is the difference between Saguaro East and West? From our experience the West section is a lot more mountainous and has far more Saguaros, making hiking more strenuous but also more rewarding when you get up high and witness the incredible sight of these giants as far as the eye can see. The big plus for the less mountainous Saguaro National Park East side is that you get to see the sunset much closer to the horizon so, on a good day, you can end up with some truly spectacular moments and photos. As I mentioned above, this was our starting point so it was no problem working it into our plan. However if you are driving from California to Texas then it is a must on your trip. While many people may include Phoenix on their Arizona road trip plans, some may feel Tucson is just too far out of the way, but we couldn’t disagree strongly enough. The trip between these two cities is a scenic and easy drive, and you can throw in an extra few miles and see some real wild west history with a visit to Tombstone. We had two nights in Tucson at the start of our epic road trip but did not arrive at the airport and pick up our car until very late in the afternoon, and after 28 travel hours in airports and planes we were in no mood to go out exploring the town that first night. So the real adventure started bright and early the next morning, but we wouldn’t get to Saguaro National Park itself until later that afternoon. First thing on the itinerary was driving south to visit the legendary town of Tombstone. On a side note this is somewhere you should also try to get to when you are in this part of the world. Sure it’s a little touristy but it does give you a good insight into life in the wild west and it does have a legitimate history behind the theme park feel. Anyway, back to the National Parks. Whether you visit Saguaro National Park East or West both have Visitor Information Centres. The east park centre is found right at the start of the loop road while in the west it is quite a distance into the park. I highly recommend dropping in for not only a map or two but to chat with the rangers. Every one of them that we spoke to to was informative, polite and obviously passionate about their National Park. We finally made it to the park about two hours before sunset and I was eager to find a good spot to photograph the sun setting behind some cacti. We underestimated the time it would take to drive around the eight mile, expected to get around the whole thing and then go back in to find a good spot for sunset. Tip #2 – if you are an admirer of amazing scenery or a landscape photographer this 8 mile loop will take hours to drive. One thing we really appreciated about exploring most of the National Parks is that the road designers understood people would want to stop often to admire the incredible views that seem to be different, if not better, around every single corner. With that in mind they have built pull out areas every couple of hundred yards or so. And we stopped at every single one of them, got out of the car, stood staring in awe at the natural beauty and taking many photos. The entire loop is on well maintained, sealed roads with the majority of the distance one way only. It was such an easy drive that Pauline even got behind the wheel for about half of it to let me get in and out more often to take photos. Now let me put that statement into context. This trip ended up with about 3000 miles of driving of which Pauline drove almost fifty. You may laugh but this is the most driving she has ever done in a country that drives on the wrong side of the road. About half way around the loop the is a fork in the road, keep right and you will stay on the loop. Take the dirt road on the left and it will take to to a picnic area and trailhead. Now there are no signposts and at some stage you may wonder if you have gone off into an area that you might not be allowed in. You have not! Once you reach the carpark at the end of the road you find a well maintained trail which lets you wander easily through beautiful surroundings. The trail is flat and the picnic area has restrooms. We spent over an hour hiking through this part of the park, searhing for the perfect cactus shot for Instagram and taking some of our trademark childish selfies and photos. We could easily have spent twice as long or even more but it was time to find our spot to watch the sunset. The picnic area and its trail ended up being a perfect spot to take in a stunning sunset. The area is quite flat with the only big hills being way off on the western horizon, and the small hills closer to us set the scene for some very impressive cactus silhouettes as the sun dropped. The main problems with having a single sunset to try and capture in a location are the weather, which was being very kind to us this evening, and FOMO! Even though we had found a few spots which were almost picture perfect you always wonder if an even better spot is just atround the next bend. So we probably kept moving a bit longer than we should have rather than taking some extra time to set up the perfect shot in the first place we felt was suitable. Tip #3 – be satisfied with an amazing scene, you don’t need to keep searching for the perfect photo location because it may not exist. We ended up with plenty of really nice images so I can’t complain too much about missing the “perfect” shot. Oh, and another bit of advice, take a jacket no matter how warm it is. Once that sun is gone so is the warmth, it can get pretty cold very quickly. I had been blown away by my long awaited meeting with the Saguaros but what we experienced on the following morning took things to a whole new level. It was time to leave Tucson and head north to Phoenix. It works out perfectly that you can drive through Saguaro West and not have to loop back to your starting point. In at the south and out through the north west, all in the direction we needed to go. Once again the roads are in fantastic condition but his time there was no one way traffic. Needless to say Pauline left all the driving to me this time. While there are now as many pullouts for stopping as we found in the east park there are still plenty of carparks while ar located at the most popular trailheads. We stopped and looked around at a few but spent more time at the David Yetman Trail which is actually south of the Saguaro National Park in the Tucson Mountain Park. While most of the hiking in the east section is more like a walk in the park on flat and well maintained paths, the same can not be said for the trails in the west. This is real hiking, loose rocks on steep trails and paths that you are not sure if you’ve gone off course of not. But the rewards outweigh the effort. The views across a sea of giant Saguaros is a sight that can not fail to take your breath away, and not just because of the altitude and effort to get there. It is one thing to see a single giant Saguaro, another to see them in a group. But to see them shoulder to shoulder stretching out for miles was more than I had imagined when I chose this place as the starting point for this road trip. Is the Saguaro National Park worth visiting? If you are after beautiful desert scenery, want to witness something that you can not find anywhere else in the world, or like me, can’t get enough of those imposing, spikey big guys then you have to get here at least once. The roads are good, the hiking ranges from easy to challenging, and the scenic rewards are great. Make sure to pick your time of year as temperatures can get almost hot enough to melt the paint off your car in the height of Summer. We visited at the beginning of February, a few weeks before the parks were covered in snow, and we still managed to raise a sweat climbing the hills. Oh, and the nights were pretty cold. Saguaro National Park was top of my list when planning this road trip. Is it still top of the list after we had finished? No, there were other parks that had me lost for words but this was still every bit of what I had hoped for. Tip #4 – take your time, get out and look around. If you try to keep to a strict timetable you are sure to miss something amazing. I would love to come back again at a different time of year when there is more colour but we do not regret for a second that we started this adventure here. As I mentioned at the start we had two nights in Tucson and have some details on the other things we did, where we slept and what we ate. It takes 60 to 90 minutes to drive to Tombstone from Tucson but it makes for an interesting half day. And while it looks a bit like a Hollywood movie set you start to feel the history when you read about what happened in each of the buildings. We visited the saloons and theatres where legends like Wyatt Earp and Doc Holliday had also spent time, saw the site of the original OK Corral (and the new tourist location more conveniently located in the centre of town). It was interesting to learn of the silver mining boom that started the town and that a few of the original mines are still operating today. If you are interested in learning more about the real history, rather than just the Hollywood version, then we can recommend the Trolley which runs about every hour or so. The driver was knowledgeable and entertaining, pointing out both the famous and just plain interesting locations in and around town. For around $10 each we found it well worth doing. We knew we would not be spending a lot of time in Tucson itself but still wanted to be close to food and convenient to the main roads in and out of town. We use Booking.com as our go to hotel site and look for places with good ratings and a budget price. In Tucson we settled on the Quality Inn Flamingo and found it very clean, comfortable and perfectly located for our visits to Saguaro National Park. We would definitely stay there again if we go back. During my research phase for this trip I had decided that I really needed to try a famous Sonoran Dog. A hotdog wrapped in bacon, buried beneath minced onion, green chile sauce, diced tomato, pinto beans, mustard, and mayonnaise. Unfortunately we were nowhere near the best locations for them when we were hungry. We did have two dinners and a breakfast away from the hotel. The hotel breakfast was ordinary at best so we took the opportunity to continue our tradition of eating at an IHOP every time we get to the USA. On our first night I really wanted a traditional 50’s Diner type experience and to get my go to chili cheese fries. We chose the highly rated Little Anthony’s Diner and have to agree with the reviews that the atmosphere is great. Decorated in the usual “Happy Days” style the place even had its own old school DJ announcing and playing all the old classics. Some fun cutouts out the front and a few beautifully maintained old cars really helped set the scene. The food was quite typical Diner fare, reasonably priced with large serves but the crazy milkshakes won me over in a big way. They also managed to make me feel a bit ill as I stupidly finished the whole thing by myself. Good fun and well worth a visit. On our second night we were looking for some cheap eats and reviews pointed us towards a burger place called Serial Grillers. With options like Psycho, Dexter and Pennywise it sounded interesting. I went for the Jack of All Trades burger which was good but not great while Pauline had a cheesesteak, which was hugely disappointing. With so many high ratings for this place I expected better. Maybe the reviewers haven’t eaten at other burger joints or are easily pleased. Glad I went to try it but wouldn’t bother going back. As I said above we would love to come back and walk through Saguaro National Park at a different time of year, not because it would be better but because I feel it would look very different. Definitely add this to your list of National Parks to visit on your USA road trip. For more detailed information on Saguaro National Park see this official site. 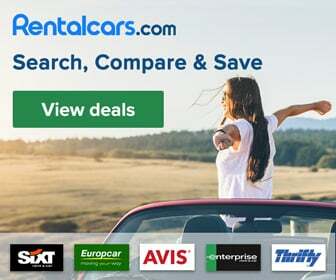 Next articleIs it safe to rent a car in Mexico? Hi Dean. It is good to see you are having a great time. David and I have been tossing around the idea of aTexas, Arizona and New Mexico trip. David’s grandfather was an avid cactus collector and brought many new specimens back (legally) from the U.S to Australia. As a result David hates the things but I think they are quite majestic. I’m going to show him this post and see if I can’t get him to an include a trip to Saguaro National Park – east/west or both. Our main problem though is that we hate leaving Sydney in spring/autumn/summer. It is so lovely here then so we do as much of our travelling as we can in the southern hemisphere’s winter – not the time to go to the hotter parts of the States. Keep enjoying yourself. I look forward to lots more posts. We’re back in Australia now Lyn but the trip was absolutely amazing. You might have to push a bit out of your usual travel time because all of the stated you mention get extremely hot in Summer. Let us know if you want ant tips or have questions about the Southwest.